Dora Suuring, Dutch Resistance fighter, chemist, lecturer, teacher: b July 10, 1914, Amsterdam, Netherlands; m (1) Sal Breemer, 1939 (diss), (2) Henk Suuring (dec) 1946, 2d; d March 31, 2017, Waikanae, aged 102. Dora Suuring once said she was only a small cog in the big machine that was the Dutch Resistance during World War II. But her work as a skilled forger helped save the lives of scores of fellow Jews. Her story reads like a film script with tales of daring escapes, false identities and daily risks she took with the Dutch underground movement. Suuring helped get Jewish families into hiding and arranged for children to be taken care of under false identities. She used her PhD in organic chemistry to forge identity papers, food coupons and passports while she herself lived under a false name as a Jew in occupied Holland. Anyone caught with a fake identity card or forging them was liable to face the harshest treatment at the hands of the Gestapo. But these were risks Suuring was willing to take. “You had to do something. I did what I could do,” she once said. Suuring was born a Polenaar in Amsterdam’s Verhulststraat​. Raised with her three sisters, she chose to study science rather than follow in the footsteps of her father and become a lawyer. Before war broke out, she was a teacher at a Montessori school in Amsterdam. Her first husband, Sal, taught at a Jewish secondary school nearby where one of his students was Anne Frank, the German Jewish girl who wrote the famous diary of her time hiding in Amsterdam before her family were deported to Auschwitz. Frank, who visited their home from time to time for evening classes, was a happy, intelligent and confident girl, Suuring recalled some years later. “She was a self-assured youngster, certainly intelligent, and rather more vocal than some her age,” she told The Press in a 2011 interview. As the Germans swept into Holland in May 1940, Suuring’s parents and sisters went into hiding and she and her husband tried to leave for England on one of many ships attempting to escape the occupation. But their vessel never left Dutch shores. 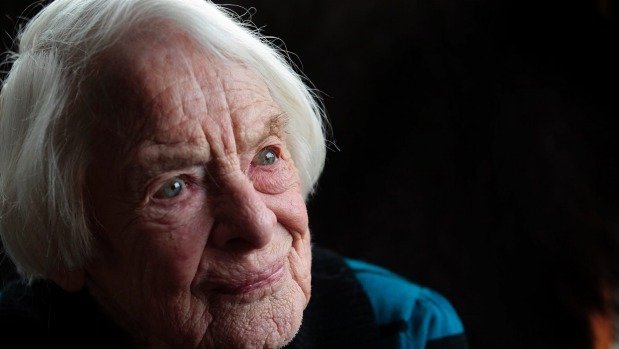 In an interview with Radio New Zealand in 2011 she told how the Germans had stormed the ship and threatened to shoot them all unless they disembarked. Later, she and Sal were persuaded to go to a special “safe” camp for Jews in rural Holland. “The Germans offered teachers, lawyers, those in the arts, to go to this camp to be saved. I didn’t want to go because I didn’t trust them, but my husband was very scared so we went,” she revealed in a documentary, Lest We Forget. But it soon became clear it was a way station for the deportation of thousands destined to slavery or death in Nazi concentration camps. When the Germans started transporting inmates to German camps, Suuring and her husband made their escape through a hole in the camp fence. They crawled through a muddy trench before making it to the safety of a farmhouse. Only two others escaped – a young lad who posed as a farm hand and a cook who hid herself in a pot, Suuring later recalled. She began her resistance work in Deventer, in the east of Holland. Blonde and blue eyed, she was not readily identifiable as Jewish and was able to move about relatively freely with her false identity. Using her skills as a chemist, she took a job in a baking powder factory, which gave her access to the chemicals used to remove photos, fingerprints and stamps from ID cards so new papers could be forged for herself and others associated with the Dutch underground. During the war she lived under four different names. She was nearly discovered on several occasions, including once when German officers were carrying out an identity check on a train she was on. Realising she did not have her papers, she hid undetected in the lavatory. Suuring, whose husband had left her after their escape from the camp, later moved back to Amsterdam, where she continued her resistance work. She hid many children in her flat, moving them out to farms in the east of Holland where they would be safe from the door-to-door searches that were common in the cities. Food was scarce and death through starvation was rife in a country that before the war had little or no poverty. She and her fellow Resistance workers made false coupons and bribed farmers for food in exchange for household items and clothing and later, gold and diamonds. As the war drew to a close, she was commandeered as an interrogator to whittle out those who had collaborated with the Germans. It was around this time that she met her second husband, Henk Suuring, who had assisted people in hiding during the war years. The couple began their new life in New Zealand in 1948. Her family had also survived the war and her two sisters would later also settle in Wellington. Though she held a doctorate, Suuring had great difficulty in getting this recognised by the then Education Department. She first taught chemistry at Chilton Saint James in Lower Hutt and later moved on to Queen Margaret College. When she got a position at Onslow College the headmaster was disturbed to find her abilities unrecognised and demanded the Education Department accept her qualifications. Suuring eventually moved on to Tawa College, then the Teachers College, and lastly to Wellington Polytechnic. Over the years she formed a bond with her students, who remembered her as quite out of the ordinary. At a time when school excursions were uncommon, she would take them out and about to learn about science at its source. Suuring, who is survived by two sisters, two daughters, two grandchildren and four great-grandchildren, touched the lives of many here in New Zealand over her long lifetime. At her service, students from the schools where she taught – all well over 70 themselves – paid tribute to a woman who suffered no fools but was utterly dedicated to helping others. One mourner recalled how he’d met her when she came into thepharmacy where he was working as a young man. They got talking about chemistry and he explained how he was struggling with his course work. Suuring took him under her wing and coached him throughout his studies. The man, now in his 80s, explained how he would never have fulfilled his potential had it not been for Suuring’s enduring support. In her retirement she devoted much time at the Wellington Jewish Community Centre. Well into her 90s, she was giving public talks at the Jewish Institute and in schools about her wartime exploits. Sources: Anja Snowsill, The Dominion Post (Hank Schouten), The Press (Rodney Laredo), Chemistry in New Zealand Journal, Lest We Forget (AC Productions), Boyd Klap, RNZ.